Like any woman driving to her first date with a new friend, I was very nervous. As I turned into his road I spotted him sitting on his wall, waiting for me. I nearly drove on past, knowing he wouldn’t see me. But I couldn’t do that to him and turned the car and went to pick Rob up. Neither of us imagined that within 10 months we would be married, but we felt that we should go ahead, as we wanted to be together, we were married on 16th March 2002 and are very happy indeed. I had got to know him through emails, in February 2001. He was running Echurch-uk, a friendly support and discussion group for people with visual impairments, and I was mailing 2,300 Christian websites in the UK to raise support for a national day of prayer for the foot and mouth crises. I had many encouraging replies, amongst them one from him. I was intrigued as to how a blind man could even use a computer, let alone write a website! I soon learned that increasing numbers of blind and visually impaired people access the Web and email through audio text browsers and digital Braille pads. We started mailing each other. We discovered that we were both going to Spring Harvest , a Christian holiday held each Easter. We were each booked for the same venue and week and agreed that I should look out for him, to say ‘hello’ if I spotted him among the thousands in the Big Top! I had seen his photo on his website, and as a 6’3” blind man, with a sighted guide bigger than he was I felt I could possibly bump into him during the week. Imagine our joint amazement when he was brought to the seat immediately in front of mine on the first evening in the 6000 seater Big Top! 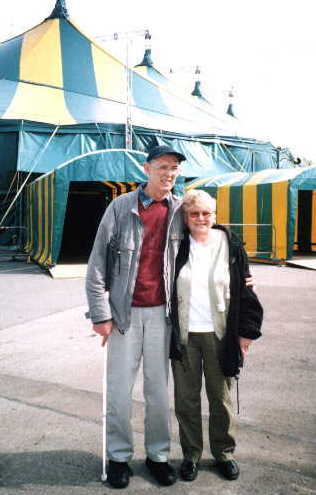 We met, briefly, twice more, the last time being when we were the first in the queue at the door of the Big Top for the final communion. He said he’d like to contact me when we got back, to arrange a meeting as he only lived 25 miles from me. We were both uncertain as to God’s will – were we to work together? Be friends? Or perhaps more?? When we finally had our first ‘date’ we talked for 6 hours, mainly about what God had done in our lives up to date. To cut a long story short we fell in love and got married on 16th March 2002, spending the second week of our honeymoon at Spring Harvest Minehead, with the bonus of lots of teaching on marriage! But our first “date” was in May 2001, which, as you have already seen, nearly didn’t happen! Rob has advanced retinitis pigmentosa and macular degeneration which basically means that he has, in the past sometimes seen a little, but not enough to be really useful but is now totally blind. My family were concerned when I first told them I was going out with a man who was blind but they have come to admire and love him almost as much as I do. They are all getting adept at leading him and the small children in the family accept that Uncle Rob has to have things put in his hand if they want to show him something. Children are remarkable for the depth of simple understanding they show. A three year old summed it up, “Rob’s not poorly, his eyes just don’t work”. This entry was posted in Living spirituality. Bookmark the permalink.